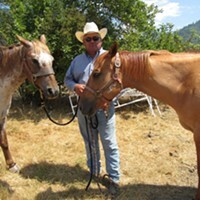 The Fortuna Rodeo is on, so saddle up for some ropin', wranglin' and ridin'. For those of us not quite ready to climb onto a bronco, the carnival is going all week long with rides and a midway right in Rohner Park ($25 for all-day wrist bands). 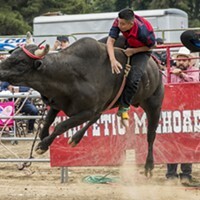 On Thursday, the Junior Rodeo continues with young cowpokes competing at the Rodeo Grounds in Rohner Park, along with barrel racing afterward ($3, $1 children 6-12, free for kids under 6). At 6:30 you have full permission to stare at firefighters during the Fireman's Games on Main Street (free). That means lots of sloshing buckets and speed drills as crews from all over the county test their skills. Friday revs up with Motorsports Night at the rodeo grounds at 6 p.m. ($5). Motocross jumper Julian D'usseau will be soaring, spinning and otherwise defying gravity on his bike. ATV racing and the infamous Quadiators should provide plenty of thrills and spills. In the Quadiator competition, passengers on each quad have balloons on their helmets and foam-covered bats — the goal is to whack other riders' balloons, and it goes pretty much how you would think. Wake up for pancakes with the Fortuna Kiwanis Club on Saturday (7 a.m., $6, $4 for kids under 12) and carbo-load for the 5K run/walk at 9 a.m. All proceeds go to Relay for Life, and you can always rest while you watch the "Ridin' with the Red, White and Blue" parade go by on Main Street at noon. The rodeo kicks up again at the rodeo grounds at 2 p.m. ($7, $3 for kids under 12), followed by the new Bands, Bulls and Brews event at 8 p.m. The Roadmasters and The Delta Nationals play in between bouts of bull ridin' and a round of "Cowboy Poker," in which fellas sit down to a game of cards in a ring with an angry bull. Last one to leave the table takes the pot. Sunday's barbecue in Rohner Park at 11 a.m. promises to be full of live music and red meat. For $12, get a heap of deep pit barbecued beef and a pile of sides — what? You did a 5K yesterday. Chow down. Then head back to the rodeo grounds for one last day of spur-jangling rodeo fun. Happy trails.